My now-6-year-old grandson, Jeremiah, was bitten by the running bug awhile back. He runs in the yard to the point that it exhausts everyone watching him. When dark, he takes it indoors and runs circles in the house incessantly. Did I say it’s exhausting to watch? He started asking about running in races earlier this year, so I volunteered to be the one in the family to be his running partner. We started in June with the Kid’s 2-Mile Turtle Trot in Stone Harbor, NJ. At 5, he and I finished second behind a 10-year-old and her mom. 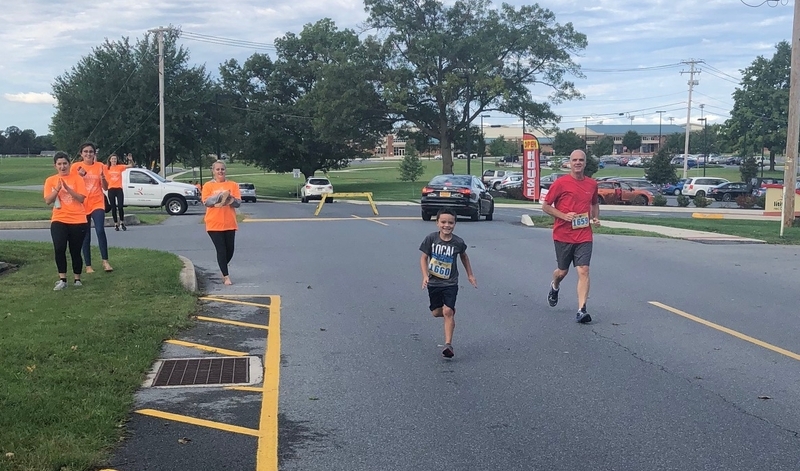 It seemed to be a breeze for Jeremiah, so we stepped up to a 5K run (of all ages) in August. While he went from running to walking fast at times, he/we did ok and finished in the middle of the pack. My frequent cheer was “slow and steady wins the race.” But in what place we finished really didn’t matter to me because it was more about doing something with my grandson that he loves. In September, we participated in another 5K race that included serious runners to moms pushing strollers. From what we could see, it looked like Jeremiah was the youngest participant at 2 days after his 6th birthday. Besides being the youngest, it’s possible he was the only runner with Autism. This is one reason we’re encouraging him to be a runner because the individual sport aligns well with how he’s wired. But until he’s running on a team, he gets to have “Pap” by his side. With Jeremiah’s Autism, he never stops talking. Sometimes he says funny things. Often, he fixates on something and says it over and over. And sometimes he says insightful things that amaze us adults. Mostly, you get to be a listener and observer with him because it’s a challenge to have what most people call a normal conversation. But we’ve all learned how to adapt and interact with Jeremiah’s gift of seeing the world in a very different way. He observes things many people miss. His obsessions evolved from dishwasher heating elements to how microwaves make things hot to fire alarm pull stations to tornado sirens to steam engines to railroad crossings. Who knows what’s next. So back to our latest 5K. It was clear from the start that Jeremiah had other plans for spending his time out on the course. Running wasn’t a priority that morning. As people were cheering the racers on shaking cow bells, we spent time talking about why cows wear bells around their necks. He noticed a train in the distance, and oh boy, that consumed a good 10 minutes of his focus. After explaining the red circle with a slash street sign, we spent time thinking up other things that weren’t allowed on streets. He spotted a worm on the street and stopped to “rescue” him by placing him back in the grass so he wouldn’t get trampled by runners or walkers. However, there were none behind us. By midway, we were in last place. And that didn’t change for the rest of the course. We finished the previous 5K in 44 minutes. Our mostly walking this time took a full hour. For the last third of the race, I would apologize to the volunteers who joyfully manned their spaces giving course directions or water only to pack it up after we passed by. I knew our family was worried and kept trying to prod Jeremiah along to pick up his pace, even if just to a slow jog. He was having none of it because it interfered with everything he wanted to tell and ask me. All I could think of was seeing race results in the paper with MY name at the end. Not sure how long I’d have to endure the jokes from family and friends. It was about then that Jeremiah must have realized I was a little frustrated because he began to cry that we were going to be last. I’m thankful this recalibrated my thinking and we spent time talking about how cool it is to run in a race and how proud we all are of him and that finishing is winning. That really didn’t have the intended effect of changing his mood. But a few high school girls grabbed his attention in the distance. They were jumping, clapping, and cheering him on. Suddenly his feet were in the air in a jog, then a full trot. He ran through their gauntlet high-fiving each girl’s extended hand. I had to pick up my own pace to keep up as he saw the finish line ahead. He was running – and hard now – toward the gate where two race timers were waiting as patiently as they could and four of our family members were cheering and rattling their bells. I then noticed the high schoolers were running with Jeremiah to keep up their encouragement. We did it! We crossed the finish line. Yes in dead last, while everyone else had gathered further away to hear the winners’ names announced. But I think they heard the commotion caused by the real winner. Even though Jeremiah doesn’t communicate the same as others, a facial expression is universal. He was a star at that moment. He “won” the race. He rescued a worm. He now knows why cows wear bells. And he reminded us all what winning looks like. Even from the view in dead last. What else did I realize that morning? I got to see a lot from behind, going at a pace where I could pay better attention. How many of us are racing toward the front – in life and/or business – in some kind of competition only to miss small opportunities that could have a big impact. The Scheffey team is full of great people, so it’s easy to encourage them to get ahead of me while I’m there to coax them only when needed. Even when pushing hard, we know the value of slowing a bit, thinking differently from others, sharing our observations, and asking challenging questions. We call it part of the creative process. That Saturday morning, Jeremiah and I did the very same thing.